I'm not talking about those crazy sizzle reels that take place in a state of sleep, but rather the hopes, dreams and desires you have for yourself and your family. Are you a dreamer? I have dreams. There's the dreams I have for my kids which includes happily finishing school, forging great careers, finding love and staying healthy. There's the dreams I have for my husband and I which includes financial freedom, seaside escapes, health and happiness. There's the dreams I have for my world which includes peace, acceptance, tolerance and gratitude. And the dreams I have for myself which includes success, longevity, good health, happiness and fulfillment. My dreams are not as general in nature as my words would have you believe. My dreams are specific. I can see the careers my kids will have, I can see the house I will be living in, I can see the world that will surround me, and I can see my achievements as plain as day. I actually prefer to think of my dreams as visualisation. A movie that is created by me to act in, direct and produce. I like to think of my dreams as a peek into the future. I also like to think of them as the destination map aligned to my internal GPS as we motor along this journey of life. There's only a small tweak that needs to be made to turn dreams into vision and vision into reality. And that's action. Actually doing the stuff you need to do to achieve results. The ability to close the gap between 'knowing' and 'doing'. This morning I opened up the little book "Passport to the Soul" which Mum gave me one Mother's Day years ago. 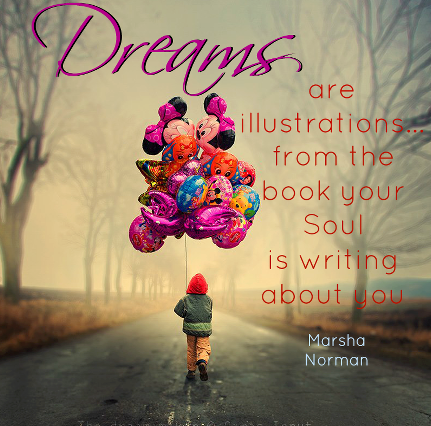 The page I opened had the quote "Dreams are illustrations from the book your Soul is writing about you". Huh. There's really nothing else to say. That quote on its own says it all. Today that quote has given me permission to sit back, relax and listen to my heart. What is your Soul writing for you? I love that image, so much power in that grasp of balloons she is holding! I must be pretty content because I only have dreams for others that they just be happy. I have similar dreams as well. My biggest dream for myself was to become a mum. It was a hard road battling infertility, but sometime in the next month it will be a reality :) I think positive thinking also helps you to achieve your dreams. If you believe you will succeed you are halfway there. We are so similar, even down to our visualisations. I love this post, I love the quote. Dreams as visualization - I like it! That quote is so true. I think about all the dreams and hopes I've had and look back how much of it has come true. And yes, it's taken effort and hardwork but I got there. Love this post. Food for thought. Oh yes I am definitely a dreamer!! We wouldn't be where we are without my dreams being turned into action. My blog, my business, our gorgeous old house we're about to renovate...are all here because of my dreams and aspirations. Dreams are possible. Great post.